This is part of an ongoing series featuring iconic projects filmed in Utah. Projects and artists mentioned in the series filmed here for inspiration, a strong sense of place or to recreate otherworldly experiences. If they each had half a brain, together they would still only have half a brain. Dumb and Dumber is just as quotable today as it was when it was filmed in Utah 22 years ago. The film follows Lloyd Christmas (Jim Carrey) and Harry Dunne (Jeff Daniels) as they set out to return a briefcase full of money to its rightful owner. Along the way these two friends find themselves in some hilarious and precarious situations. From the movie, we will forever have gems like “so you’re telling me there’s a chance” and “welp, big gulps huh.” While the film did give us serious #squadgoals we are still a little hazy on some life rules. Can we triple stamp a double stamp? When is it OK to quitsie a startsy? We may never know. Aww, well the feeling is mutual! Utah residents certainly love spotting their local hangouts in Dumb and Dumber. Harry and Lloyd share an apartment that has carpet stains and wall art you may commonly find in a young bachelor’s place. Their quaint homestead apartment is located in the heart of downtown Salt Lake City. Farrelly told City Weekly, “Believe it or not, we had to re-create that [For Dumb & Dumber To] because the guys haven’t grown up at all, and they’re still living in the same place, and so we actually had to rebuild it in Atlanta. It might have made more sense for us to just fly out and do it there. Mary Swanson’s East Coast Mansion is actually a cleverly decorated restaurant building called La Caille in Sandy near Little Cottonwood Canyon. Another La Caille building was used as Mary’s parents house in a fantasy cooked up by Lloyd. The horse drawn carriage Harry and Lloyd use to leave the esteemed Aspen Snow Owl Benefit is actually parked outside the Devereaux Mansion. (Too bad they didn’t use the Mutt Cutts van) The mansion has all kinds of fun history and it’s a favorite for local SLC ghost hunters. You may recall Harry and Lloyd sharing a bath along their journey at the Second Best Motel. The exterior of the hotel was redecorated slightly but the building is the modern day Heber Inn in Heber City, Utah. City Weekly caught up with the location scout Lee Steadman who mentioned the heart shaped tub itself was actually filmed at The Osmond studios in Orem, which is now the Cirque Lodge rehab clinic. Mary’s parents enjoy the finer things in life and their East Coast mansion is actually a cozy but large cabin in Deer Valley. Which one? We are not totally sure. This is a hotly contested 7-Eleven location where Lloyd very famously declared “big gulps huh?” Side note, apparently that line was ad libbed by Jim Carrey. According to City Weekly, this is a big gulp shop in Heber City though some residents firmly believe it was a 7-Eleven in Ogden. 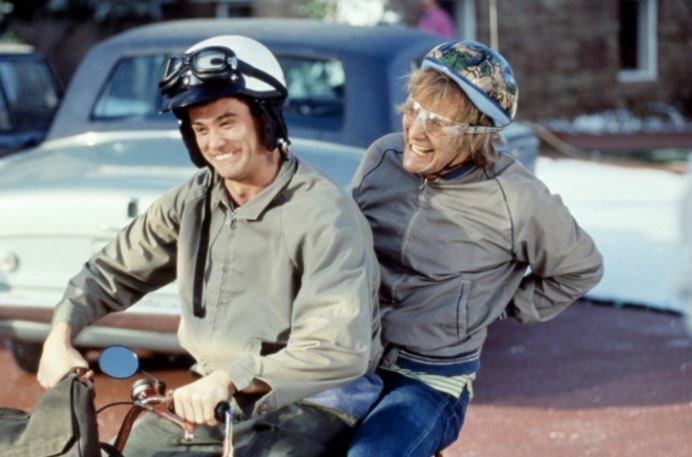 Portions of the famous scene where Lloyd and Harry ride into Aspen on a mighty vespa with ice crystals hanging from their noses were filmed in Park City. We know there are more glimpses but those are just a few from the famous 1994 flick. If you’re really adventurous check out Ski Curbed for the route that begins on the East Coast before finally arriving in the Beehive state. Contributing writer Elizabeth Latenser is a film fan, mountain momma, dog lover and tree hugger.